Do you have your business card on you? Do you have your phone with you? No and yes? That's what I thought. Of course you remember to carry your business cards for trade shows and industry events--but what about on a daily basis, for those random coffee-house encounters, or for those times when you want to connect with someone at a party who happens to work for a company you want to do business with? It may be easy enough to create business cards and print your own cards, but remembering to carry them is an entirely different matter. With the following free smartphone apps and services, you can carry a digital version of your card and easily share it with anyone. The people you meet don't even need to have the same app themselves, as many of these tools also allow you to send your card via email. 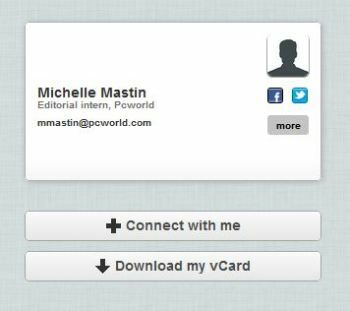 Many of these apps add features that paper business cards can't offer, such as location and event tracking--so you can remember where a certain card came from--or matching widgets to add to your website. And some will import your information from Facebook or LinkedIn, or allow you to organize your information into multiple cards representing various side businesses or freelance projects so that you can share only the information that's relevant to a particular contact. A relatively new player in the digital business card arena, CardFlick just launched its iPhone app at TechCrunch Disrupt in San Francisco earlier in September--and it has already seen more than 17,000 downloads. An Android app is coming soon. The iPhone app requires iOS 4.0 or later, though I found it susceptible to crashing on an iPhone 3G (not 3GS). The developers are very active, being a new startup, and the app is already up to version 1.02, so they should fix the crashes and bugs quickly. CardFlick creates clean, professional-looking cards, but gives you only one. You can create your CardFlick card by importing your information from Facebook, or just entering it manually. It doesn't have many fields to fill out, however, so entering your information by hand doesn't take too long. I chose to enter my information on the CardFlick website, as the iPhone app didn't seem to save my changes. You get only one card, so you have to decide how personal you want the card to be. Though the app has just 14 card designs to choose from right now, all of them look professional. After you have set up your card, you simply flick the card to the top of the screen to send it to any nearby phone that has the app open; the app finds nearby users via GPS, and then sends the card over Wi-Fi or 3G. If your intended recipient doesn't own the CardFlick app, you have the option to send the card via email. Once you receive someone else's card, you can add it to your contacts. The cards remain connected to the cloud; when you update your information, the updates push out to everyone who already has your card. Right now, CardFlick is a minimal app with a simple website. The options are thin, but the designs are attractive. Custom designs are coming soon, too. The idea of “flicking” cards over to other users is fun, and you can always email the card as a backup. This is a good app to try if you use an iPhone and need to carry only one card. Available for iPhone only, SnapDat offers plenty of options for creating business cards, including importing data from your contacts, creating a card from a custom background, or using a scanned image of your current paper card. SnapDat also holds multiple cards that you can choose from when it's time to send one; that way, you can keep one card with personal information, another with your business information, and another with your freelance or consultant information. SnapDat has more design options and allows you to carry multiple cards. The cards have additional input fields for extra phone numbers or email addresses. You can import information from your iPhone address book, and the cards can have links to LinkedIn, MySpace, Plaxo, Twitter, or even an embedded YouTube video. The service integrates with VistaPrint to provide options for turning your digital business card into the paper kind, as well. Incoming cards are geo-stamped with location data, and can include messages and reminders to help you recall when and where they came from. You can mark each card as public or private to control whether the recipient of your card can share it with other people. The cards are also interactive--you can place a call or send an email message from the app. Sent cards go to the other user's SnapDat SnapID (you set up a SnapID when you first open the app), but you can also send the card to the person's email address if they don't have the app or a SnapID. You can make cards public via Facebook, which puts it on your wall, or through Twitter--although on Twitter the card blasts out as a public tweet rather than as a direct message or "@" reply. SnapDat is a robust app for iPhone users who need to carry multiple cards, or who want an easy way to turn their digital cards into paper ones. In addition to the app, CardCloud gives you a contact website with links to get in touch. The Cardcloud app is available for iPhone, Android, and other smartphone platforms via a mobile version of its website. It allows you to carry multiple business cards, with information that it pulls from LinkedIn or that you enter manually when you sign up. You can import information from contacts, but in my tests this app kept mixing in information from other contacts as well, and I ended up having to create my cards manually. You can connect your business cards to a wide variety of social accounts, including (deep breath) About.me, Delicious, DeviantArt, Facebook, Foursquare, GitHub, Google Profiles, Gtalk, Hyves, LinkedIn, Mobypicture, Picasa, Skype, SlideShare, SoundCloud, Tumblr, Twitter, Vimeo, Xing, and YouTube. Unfortunately, my attempts to add services from the mobile app didn't stick, and I had to add them from the Cardcloud website. 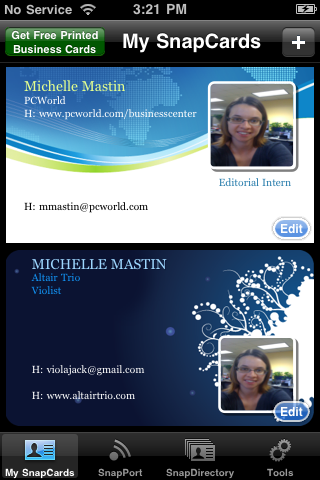 The Cardcloud website keeps track of the business cards you share and receive. 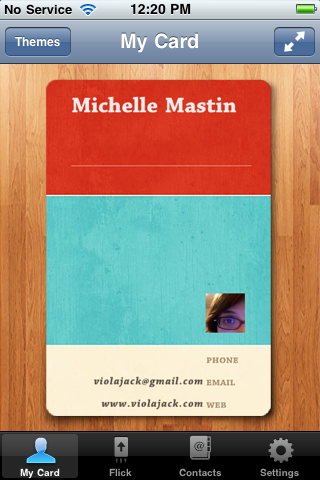 You can take notes on the virtual back of a card, and then add the card to your phone's contact list. Cardcloud is a good choice for anyone with a non-iOS smartphone. It’s also great for people seeking a quick and easy way to add clickable contact information to their website. Available for both iPhone and Android, Bump has an open API (application programming interface) that allows developers to add "bump" functions to any other app. 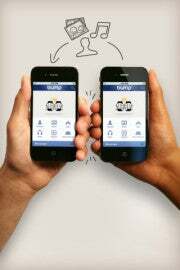 The Bump app shares data when two phones physically bump together. Each phone detects the bump via its accelerometer; using timing and location data, Bump’s servers then connect those two phones for sharing. The Bump app is designed to share all kinds of information, including photos, apps, and contacts. When you share contact information, you can choose which pieces of information to send and which to keep private, so you don't have to share, say, your home phone number with your new business contact. Once you have "bumped" someone, that person will stay in your Bump contacts list, and you can send them new information at any time. Bump also has a "virtual bump" feature for connecting with someone far away, but it still requires that person to have the app. You get no option to send contact information via email if the other person does not have the app. Bump is a fun way to share information, and a great choice for sharing anything with people who already have the app on their phones as well. Are Digital Business Cards Better Than Paper? Having the digital version of a business card is nice, as it makes entering new contact information directly into your smartphone's contacts list easy. Digital cards can also carry more data, such as location information and actionable links to social networking services. You can never run out of digital cards to give away, while paper ones disappear quickly. Sharing cards via smartphone is a novel experience, too, and can help you stand out in your new contact’s memory. Despite all of those benefits, I found myself wishing for paper cards at a recent event. I didn't want to have to pull out my phone, unlock it, open the app, find the right card, and then end up just having to email it anyway. I felt that I hadn't really connected with people when I just emailed out my card. And digitizing the physical business cards I brought home is so easy: All of them will go straight into my NeatDesk scanner. The NeatWorks software will read the text on the cards and import the information into my contacts list, which constitutes only one more step than receiving a digital card in the first place. In the end, there's still something to be said for physical, paper business cards.